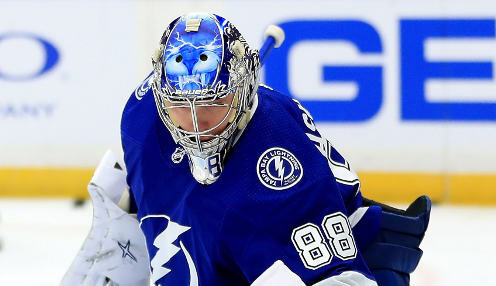 It may only be the regular season, but there was a feeling of the torch being passed on Saturday as the Tampa Bay Lightning defeated the Washington Capitals 6-3. Alex Killorn had a hat trick and Tyler Johnson, Erik Cernak and Yanni Gourde all got on the score sheet at the Amalie Arena in the first match up of the year between the two sides. The two teams are scheduled to play twice more in the next couple of weeks. Winners of four in a row the Lightning lead the Boston Bruins by 19 points with 10 games to play and can clinch the Atlantic Division title with a victory or a Boston loss. That could well occur on Monday when Tampa Bay welcomes in the Arizona Coyotes. Alex Ovechkin scored twice for the Capitals and the Russian leads the league in scoring with 48 goals. Absent an injury or an incredible slump, Ovechkin, who led the league last season with 49 goals, will become the first player to score 50 goals in a season since he did so back in the 2015-16 campaign. Washington leads the New York Islanders by two points in the Metropolitan Division although the Islanders do have a game in hand. With the Pittsburgh Penguins the distinct possibility as a first round opponent, there is certainly an incentive for both the Capitals and the Islanders to win the Metropolitan Division and avoid Sidney Crosby and company. The Lightning are 12/1 to win the Stanley Cup this year with the Capitals 5000/1 and the Penguins 5000/1.